There is nothing quite like getting on a lake. 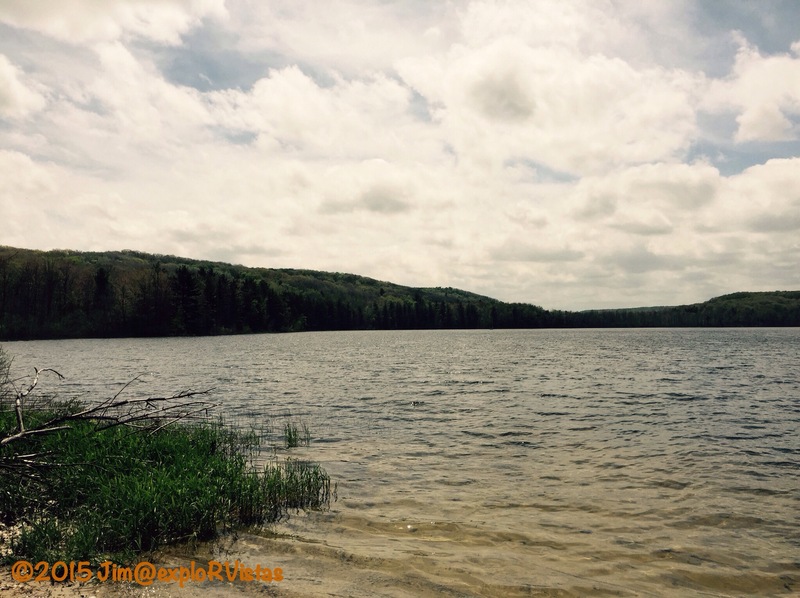 For today’s paddle, we chose School Lake, located within the boundaries of Sleeping Bear Dunes National Lakeshore. School lake is connected to the smaller Bass Lake by a channel that might allow a kayak to get through. 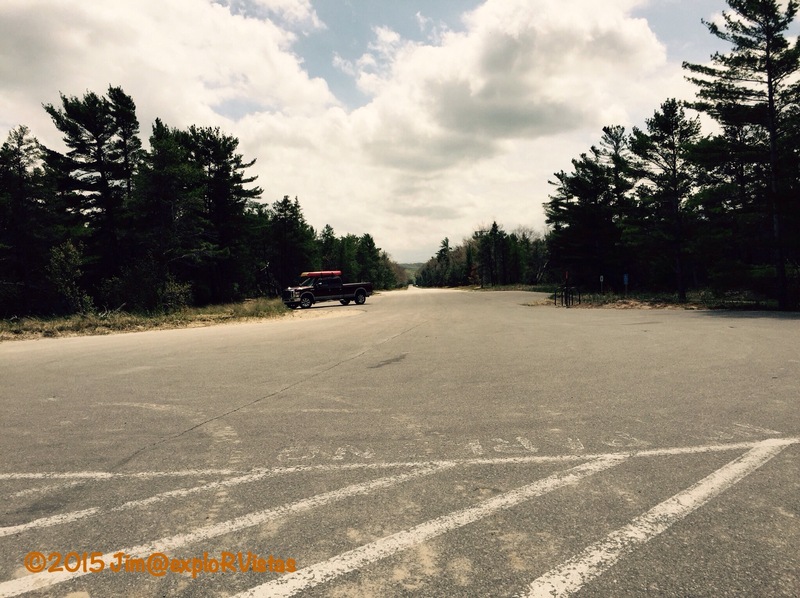 The reason we chose School Lake is that Bass Lake borders right on M-22, and carries some traffic noise. Except for the boat launch, School Lake is all natural. The launch is decent, even for small, trailered boats. There were two aluminum boats on the lake while we were there. The lake itself measures in at approxametely 2/3 of a mile across, and is somewhat round in shape. The bottom appeared to be sandy, and the water was clear. There is a fairly high ridge that runs south of the lake. The wind was coming from that direction today, and we found the calmest water along that shore. Here is Ketchup and Mustard, ready to go! We did not take any photos on the lake, as we have to still get a waterproof case for one of our phones. If anyone has recommendations, we are all ears! We asked a young couple who were mushroom hunting to take our photo. They were kind enough to oblige. 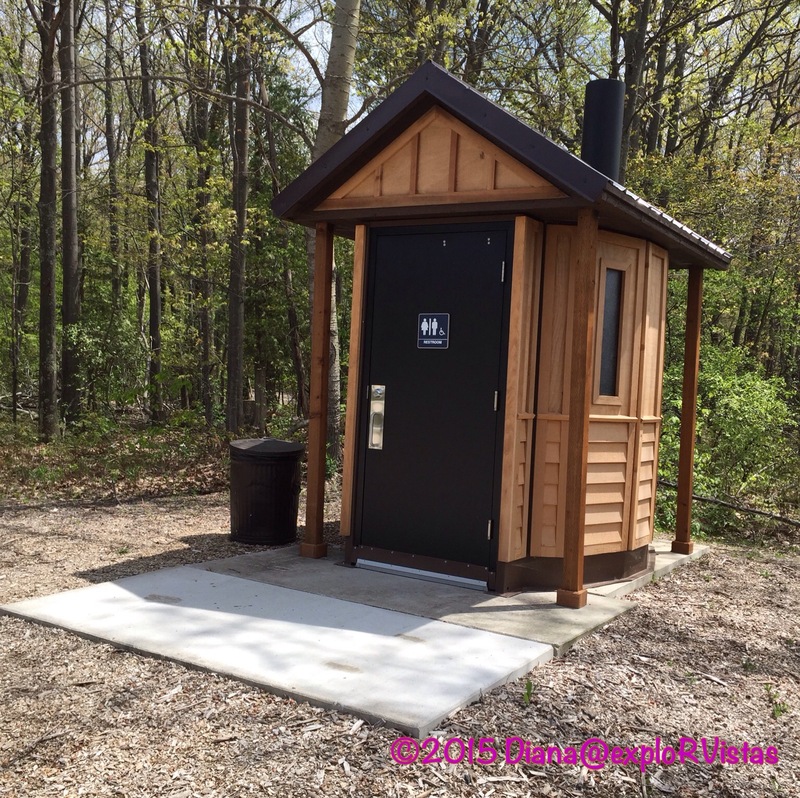 One other thing to note about Sleeping Bear, are the ‘facilities’. 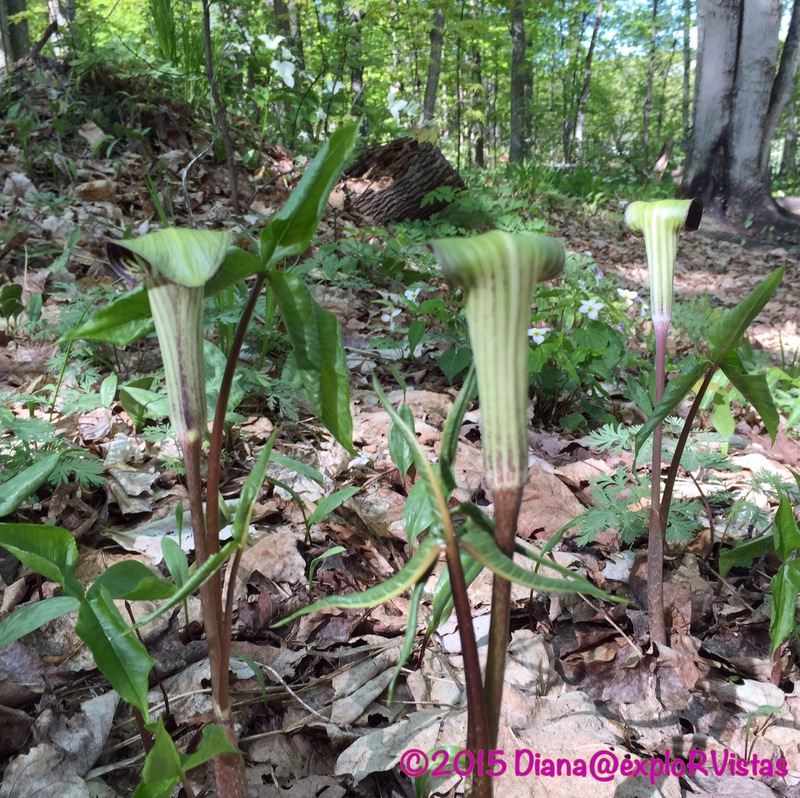 Diana spotted these Jack-in-the-Pulpit up near the yurt at Wild Cherry. They were huge! 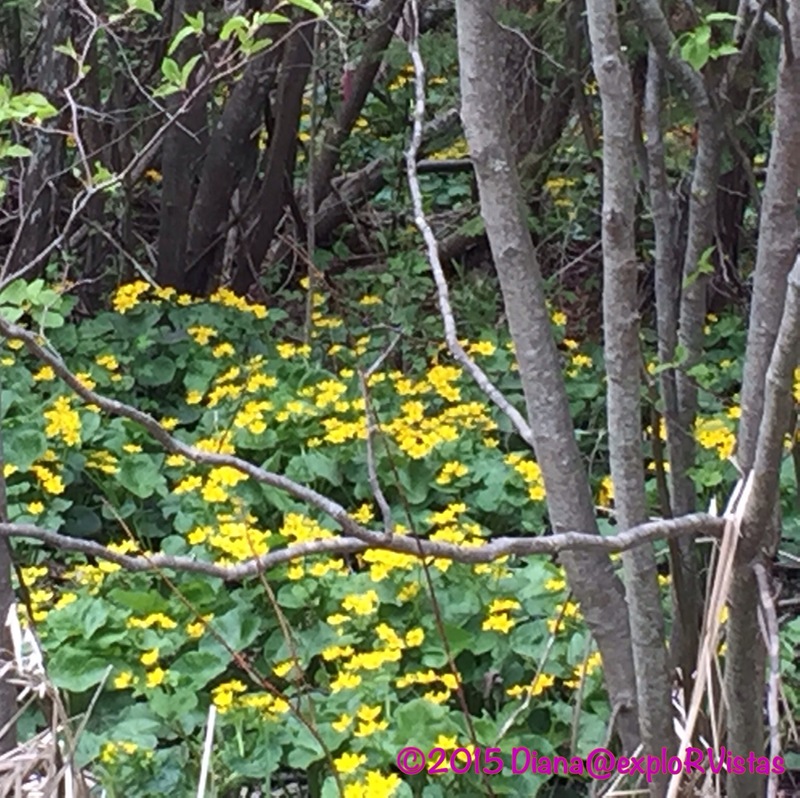 She also spotted these marsh marigolds after we got off School Lake today. They are popping up everywhere. 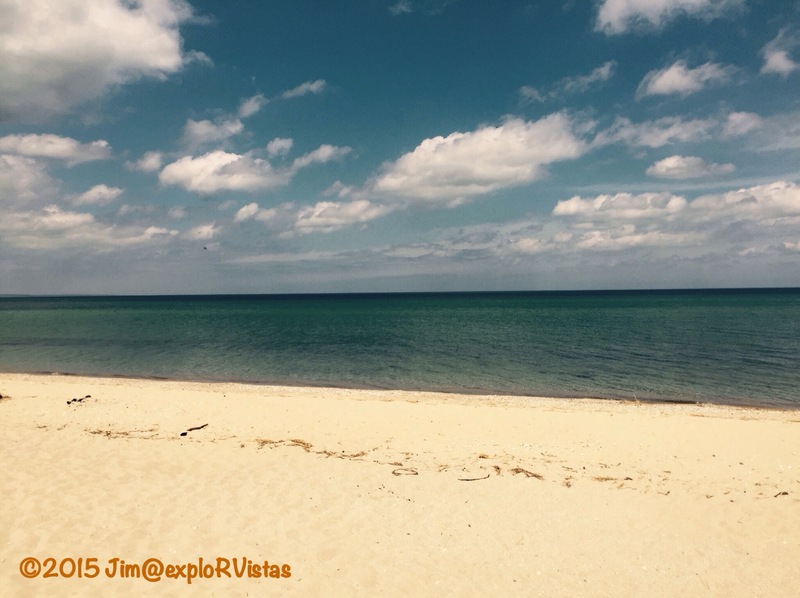 One of the places we visited a couple of weeks ago was Good Harbor Beach. We decided to drive out and take a look today, as it is just up Bohemian Road from School Lake. We got there, and we were the only ones there. Hmmmm… 80 degrees, partly cloudy… What is up? Not a soul on the beach…except for the flies. Tons of them! Yikes! We know that the northern Great Lakes can be iffy for flies in late May and early June, so we will have to keep tabs on the conditions. It may have been because there was rain coming in. At least they weren’t biting, and they were confined to the beach itself. All in all, it was another great day! We were able to get the kayaks back in the water, and that was a great thing! 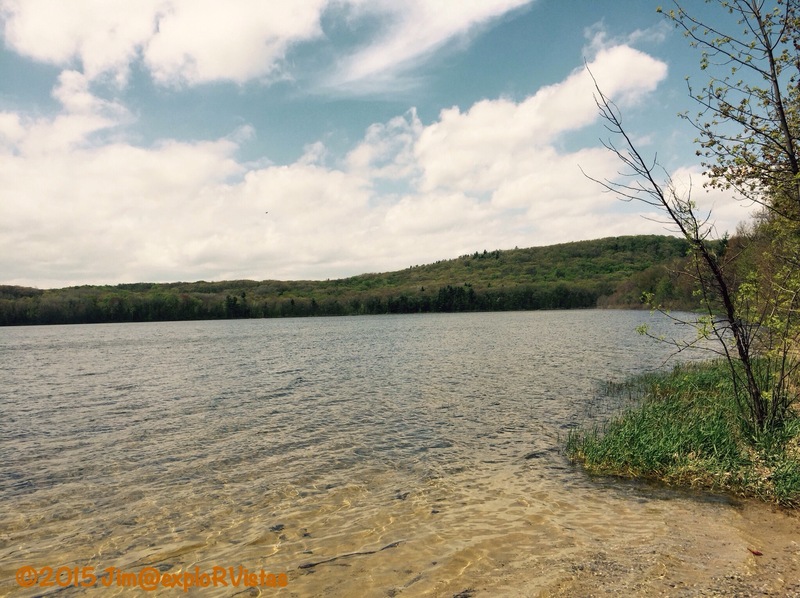 Do you have a favorite body of water you like to paddle? We would love to hear about it! 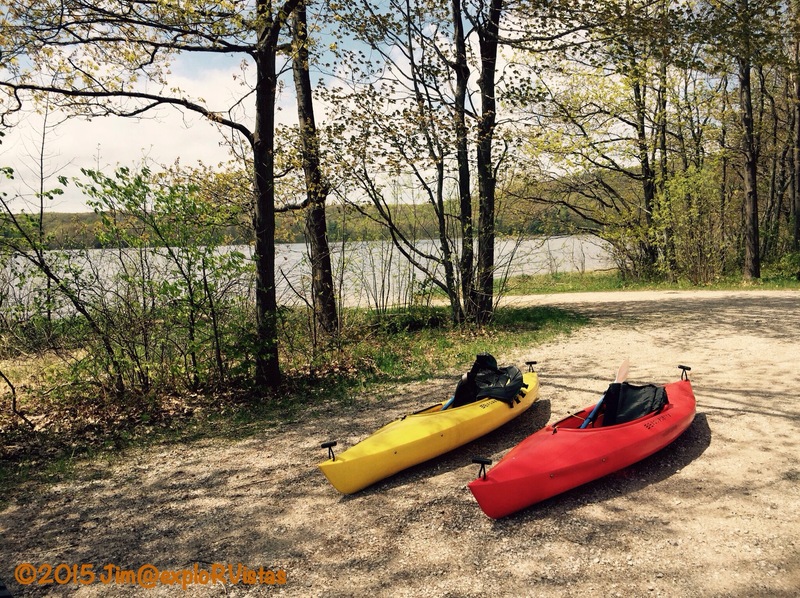 We’re thinking about inflatable kayaks, where do you put Ketchup and Mustard while traveling? If you look back on our early April post “Harvest Hosts”, you can see the rack on top of our truck. We have two simple Thule bars. Our truck is a long box crew cab, plus we have a Pull-rite SuperGlide hitch. We don’t come close to hitting the kayaks. If you check out http://downtheroadwithsteveanddebbie.blogspot.com, they have a two person hard shell kayak mounted similarly. We love our hard shells, as they are off the truck and in the water in a flash. And we never worry about puncture. We have had them for 17 years, and they still look like new. I have the record on how quickly one can capsize a canoe, AND how fast one’s arm can shoot out of the water with camera in hand. Oh the memories that singular event brings to mind. Glad YOU had fun — I’ll stay in boats that have some beam to them. Part of MY problem is that I’m a fidgety sitter. Looks a lovely place. I think we need to spend more time in Michigan parks. When we were younger we spent a lot of time going back and forth from MKE to Toledo and Michigan became kind of a blur that we avoided only because it wasn’t en route. We have made a lot of trips over to the Blue Water Bridge on our way to Toronto but I think we need to do much more…. 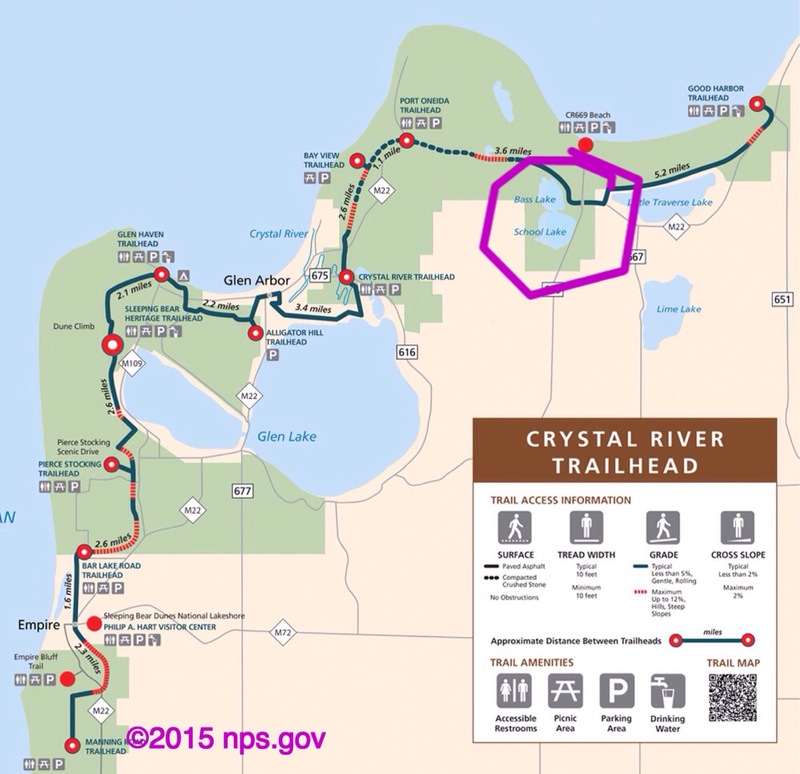 And up and around the Soo and Mackinaw…. So much America and So little time…. Glad you got to get you boats in the water. It look like a beatific place. It sure is, Bonnie! We are looking forward to hitting the other lakes in the area also. Looked like the perfect day to get out on the water. We will be in Canada this time next week and will hopefully be on the water the next day. Our favorite non-fishing kayaking spot so far has been Rainbow Springs outside of Dunnellon Florida. I was wondering when you were going to get back to Canada, Jim. I’ll bet you will be glad to be back! That area of Florida was where we wanted to kayak. We will definitely do that soon. This area has been everything we had hoped it would be. And boy does the wind blow! 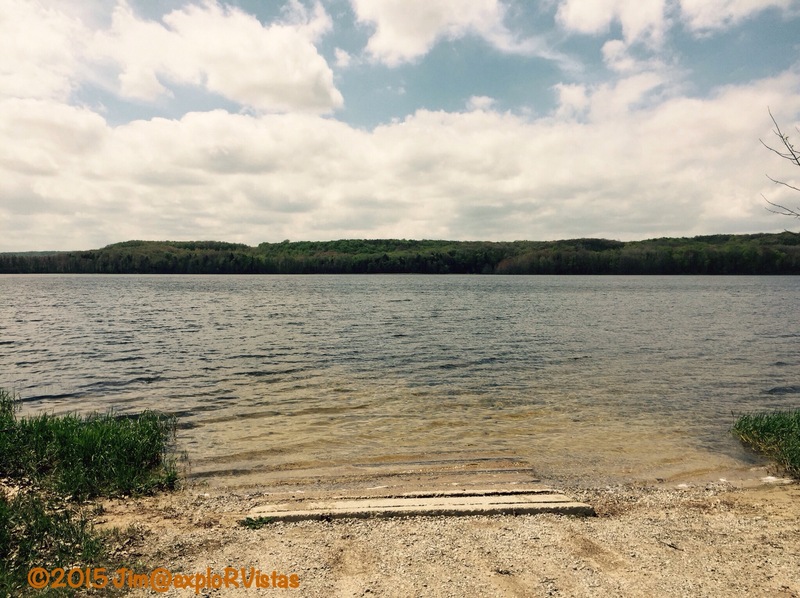 The campground sits in the middle of the peninsula, about 300 feet above Lake Michigan. A very dynamic place, for sure. Love the Jack in the Pulpit picture. Nice, Catchup and Mustard! Cute. Looks like a great place to hit the water. My favorites are anywhere in the Adirondacks (Upstate NY) and anywhere in the Sierra Nevada mountains (Calif). We haven’t been to the Adirondacks since the 1980’s. We definitely are overdue, Debbie! The Sierras are definitely amazing, also. What a cute story from that little girl! Oh man, wow! How awesome it would be to get to do what you two did! My husband had a job offer in Marinette, Wisconsin earlier this year but we didn’t wind up going. Are yall near there? About 80 miles due east, as the crow flies….almost all entirely water. 🙂 What is his line of work? Awesome! It was for that shipyard up there. I’ve done some kayaking in Mackinac island and it was awesome ! We want to get up that way this summer, Gin. It is an easy day trip from here. We want to get back out soon. I bought a waterproof Otterbox case for my phone, so I will be able to get some photos on the water next time. 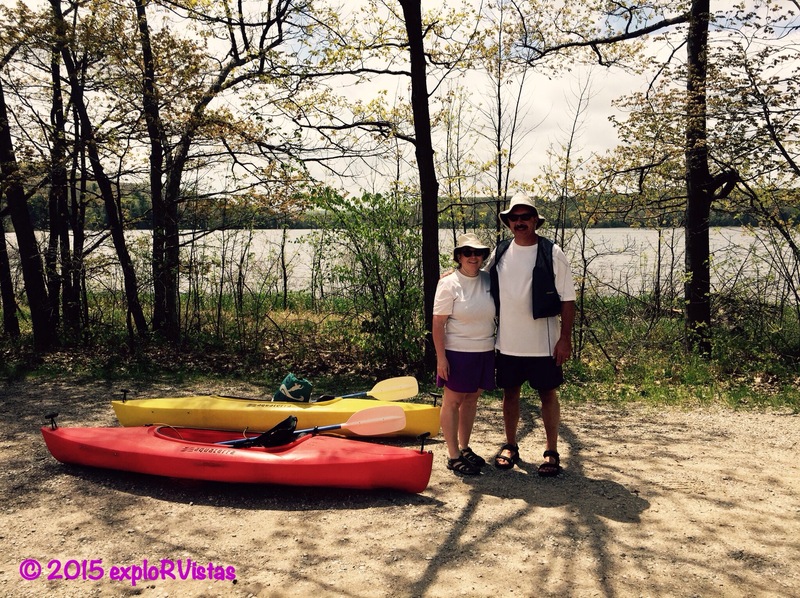 Be sure to post about your paddle, Inger!